Two weeks ago, The Border States of America premiered to great fanfare in Los Angeles. 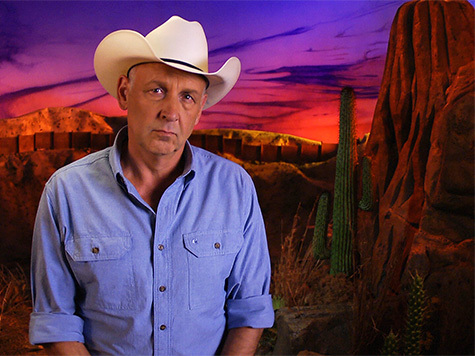 Justified’s Nick Searcy, our documentary’s host, was both gracious with his time at the premiere, and courageous to take a stand on such a critical issue. More than 9,200 people viewed the live stream, shown jointly on Breitbart and Tea Party Patriots platforms, many of whom tuned in to the Red Carpet pre-show and panel discussion afterward, in real time. Additional thousands watched at more than 1,300 house parties across the country, and we’ve distributed close to 20,000 DVDs. Catalysts: The people who made Border States of America a reality, Left-Right. Jenny Beth Martin, Pritchett Cotton, Gregg Cummings, Luke Livingston and Mark Hager, with Kevin Broughton during BSA premiere. As I wrote here two weeks ago, the idea for The Border States of America came from one of our leading grassroots activists, North Carolina’s Mark Hager. Our members expressed support – through dedicated donations – for the project, and we knew the final product was a visually stunning and compelling case for securing our Southern border. What pleasantly surprised us was the way the project has gone viral since the premiere. This film’s reach has exceeded our expectations, with more than 85,000 views since the premiere. Our film crew followed our front-line troops, the border sheriffs, as they deal every day with human trafficking, property damage and cross-border gang violence. These woefully undermanned and underfunded first responders reap the consequences of the Administration’s open-borders and amnesty schemes. They are overwhelmed, as the rest of the country will soon be, absent a unified voice against any amnesty, executive or legislative. The Border States of America obviously struck a chord and enthusiasm for the film is growing, because rank-and-file Americans are opposed to the Obama administration’s lawlessness that has resulted in this border crisis. The emergence of the ISIS and Ebola threats should only intensify our efforts to secure the Republic’s Southern border. And that’s why we’re partnering with Breitbart again to re-stream Border States, right here on Thursday and Saturday. It’s the most important documentary you’ll see this year. Because every state is now a border state.